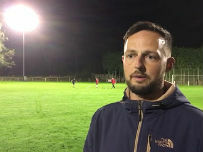 My thanks to first-team manager Shaun Harris for sending me his considered thoughts on the MMP with Norman Lloyd league second-division reversal against Rhayader Town on Saturday, 26 January. “We were a little unlucky to be on the end of 4-2 defeat,” he said. “The pitch was a mud bath by the second half which really affected us playing any kind of football. “The pitch suited Rhayader more than us as they are always a big strong side and were able to take advantage on a heavy pitch. “We all feel very disappointed to lose yet another game. “Before kick off we’d hoped to get the three points we desperately needed. “But we conceded yet another penalty which also resulted in our losing our keeper to injury and that made the scoreline 3-1. “We do seem to have a lot of hard luck in games at times but when you’re on a bad run things can go against you and we are trying everything to turn it around. “We have lots of new faces in so we do feel a win is coming. “The league is so open and anyone can beat anyone we are targeting at least three wins from our remaining games. “Our goalscorers were Duane Anning and Tommy Murphy who marked his debut for the club with a goal. “In terms of the squad, we have lost Jordan Cooper as he feel the travelling is too much for him on a regular basis.